How Does Your Real Estate Tax Bill Compare To Other Parts Of The Country? Mortgage rates may be a function of free markets, but real estate taxes are a function of government. And, depending on where you live, your annual real estate tax bill could be high, low, or practically non-existent. Compiling data from the 2009 American Community Survey, the Tax Foundation, a non-partisan educational organization in Washington D.C., published property taxes paid by owner-occupied households, county-by-county. The report shows huge disparity in annual property taxes by region, and by state. As a percentage of home valuation, Southeast homeowners tend to pay the fewest property taxes overall, while Northeast homeowners tend to pay the most. But statistics like that aren’t especially helpful. What’s more useful is to know how local real estate taxes stack up as compared to local, median household incomes. Not surprisingly, real estate taxes are least affordable to homeowners in the New York Metro area. The 10 U.S. counties with the highest tax-to-income ratios physically surround New York City’s 5 boroughs. 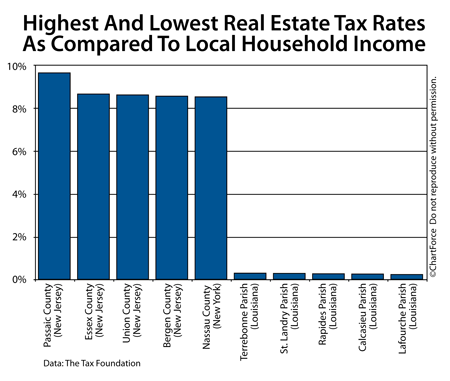 The areas with the lowest tax-to-income, by contrast, are predominantly in southern Louisiana. The U.S. national average is 3.0 percent. The complete, sortable list of U.S. counties is available at the Tax Foundation website. For specific tax information in your neighborhood or block, talk with a real estate agent. Whether you barbecue for friends or family once annually, or through all 4 Sacramento seasons, it’s important to keep a clean gas grill. A well-maintained grill will help your food taste its best — no matter what you’re cooking up. With these tools in-hand, follow these basic steps. First, disconnect the propane tank and move the grill onto the drop cloth. Open the grill and remove its grates and the flame guards (the v-shaped metal pieces on top of the burners). Then, disconnect the igniters and remove the burners. Soak the grates in hot water if they’re excessively dirty. Set the pieces aside for cleaning. Next, clean out any loose debris from the bottom of the grill. 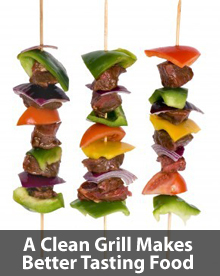 Use the detergent to make a soapy mixture and scrub the bottom of the grill, including its grill pans and grease trays. Clean the grates at this time, too. Gently brush the outside of the burners with the wire brush, then allow running water from the garden hose to flow through the tubes to clean out the insides. If the burners appear to be cracked, replace them according to the grill manufacturer’s instructions. Allow all of the above cleaned pieces to air dry, then reassemble the grill. Next, clean the outside of the grill using a soapy mixture and a soft sponge, treating early-stage corrosion with some cooking oil applied like car wax. If your grill has a stainless steel exterior, wipe with the grain to minimize streaking. And that’s it! Cleaning a gas grill can be time-consuming, but better tasting food is worth it. Plus, your grill will last longer. How Does Your Work Commute Compare To Other Cities? As part of the Census Bureau’s data collection activities from 2005-2009, a number of interesting charts have been published at http://census.gov. The data should not be confused with Census 2010 — a separate survey conducted every 10 years. This is the first-ever, 5-year American Community Survey. Based on data from 3 million households, it details social, economic, housing, and demographic data “for every community in the nation“. 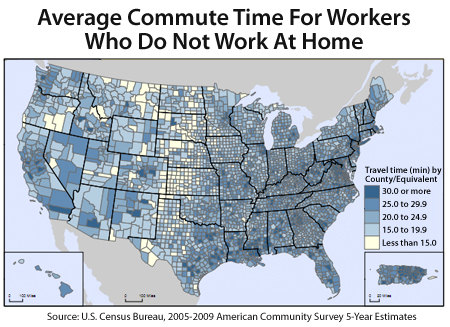 The ACS survey also charts average commute time by county. The chart is shown at top. Whether you live in a “long commute” town like Richmond, NY (40 minutes), or a “short commute” town like King, TX (3.4 minutes), rising gas prices have made commute times and distances relevant to everyone. Since the start of 2011, the average price for gasoline is higher by 54 cents per gallon. Assuming 22 miles per gallon on a passenger car, that’s an increase of 2.5 cents of gasoline per mile driven in the last 90 days. It’s a cost that adds up quickly, and can affect a household budget. Plan for higher pump prices moving forward, too. Historically, gas prices surge between April and June. The American Community Survey is loaded with charts and data. It can tell you a lot about your current neighborhood, and any neighborhood to which you may want to relocate. Then, to bridge the ACS data with community details such as school performance and typical home prices, talk to a real estate professional.